Abenomics 101: Japan has a credit bubble, and it bursts because of high interest rates. Abenomics 102: Japan gets stuck in a liquidity trap – at least, if you’re a believer in Paul Krugman. Even though I mentioned “the Lost Decades” in the last post – they really need a little more attention. After all, the real fear is that the missteps of the Fed and the American government will result in “The US Lost Decades”. And, I suppose, that the missteps of the ECB and the Eurozone governments will do the same in Europe. But realistically, Europe has a much grander set of structural issues. Also, we still look at Europe at an individual state level – and if Greece, or Italy, or even France, disappear from view for a while – the rest of the world probably won’t notice (no offence intended!). I’ve talked about some of what was happening in the Lost Decades; so now I’d like to focus on the activities of the Japanese Government and the Japanese Central Bank (Bank of Japan – the BOJ). Because, surely, their steps should give some guidance on what-not-to-do-after-a-credit-crunch? Doing absolutely nothing about the banking sector – other than continuing to fund it. Well the result tends to depend on how you look at it… Many people argue that the whole “Lost Decades” story is a bit of melodrama – because the general standard of living of the Japanese remained more or less the same. And if everyone continued to live as well as they did in the 1980s – then what’s the big deal? They were already living quite awesomely, after all. Frankly – I think that argument is a bit myopic. The 1990s and the 2000s were the most spectacular years of global consumerism in the financial history of humankind. And Japan, the third largest economy in the world, the exporter of electronics and vehicles, continued to languish in almost the exact same economic spot while all that was happening? Uh no. That’s not success. The other side of the argument is to say: those policies prevented everything from being worse! But much as I’m a fan of the glass being half-full, it does smack of half-measures. Or only half of them working. Or something. Paul Krugman was the outright proponent of Japan-not-recovering because of Japan-being-stuck-in-a-liquidity-trap (see Abenomics 102). And also – because everyone is looking at the wrong data-sets. Japan has a rapidly aging population, with low fertility rates and next-to-no immigration – which means that you have swathes of people leaving the work-force each year without equal numbers entering it. That fact alone would contribute to a lack of growth, as Japan is literally bleeding “resources”. If we go back to the Chocolate Cake analogy from yesterday – Krugman is saying that one of the reasons why the chocolate cake (monetary stimulus) doesn’t work in a liquidity trap is because you don’t believe that you’re going to get lots of it. You’re just going to get a taste, and as soon as you show any interest in eating again, the good doctor (being the Central Bank) is going to take away the cake and let you get on with eating something boring. What he would like to see is the doctor credibly promising to give you as much chocolate cake as you would like – a “pedal to the metal” situation. And how is that a negative real rate of interest? If I’m to continue with the Chocolate Cake/binge-eating analogy – there is a taste-fat trade-off in food. The better something tastes, the more likely it is to make you fat. And it works the same way here. The higher the interest rate, the less likely you are to consume – which means that the economy is less likely to experience, ah, inflation. And conversely, the lower the interest rate, the more likely you are to go out and spend money – which will certainly be inflationary. In my mind, the Krugmanite viewpoint sees Japan’s liquidity-trap as a form of economic anorexia. The government spending (fiscal stimulus) was an intravenous drip of nutritive supplement, which at least meant that the economy was surviving. But in order for recovery really to take place, you needed to get Japan consuming on her own again. So the doctor (the BOJ) needed to commit to allowing a high-carb, high-sugar, taste-bud-tittilating diet (in the form of negative real rates of interest), and allow Japan to pick up some weight (inflation). According to Paul Krugman – the problem was that the BOJ forays into quantitative easing (which would have caused the real interest rate to drop into negative territory) were always perceived to be short-lived by the Japanese. That is, at the first sign of growth and/or inflation, the BOJ was desperate to back-out. This prevented inflation expectations from being formed, so no one had any reason to do anything other than save. Which is why Japan still hasn’t recovered. 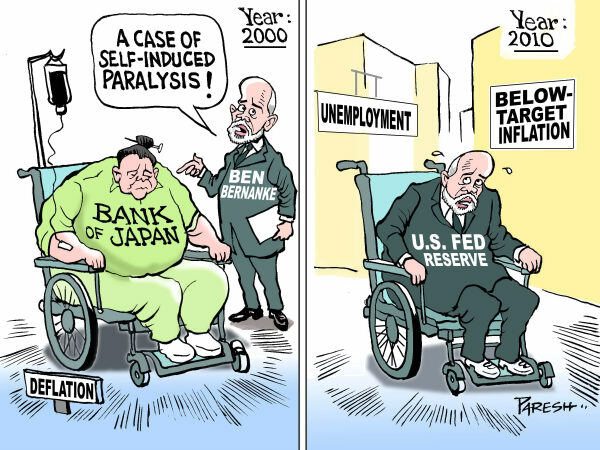 America is busily repeating all of the policies that Japan tried. *You can also read this post: the Drag(hi) of Negative Interest Rates.